Jeremy Corbyn will no doubt discover that the wisdom of crowds isn’t always enough nor is meeting with busy world-famous economists and other wise-men and -women four times a year. Here are some books to hone his arguments and stimulate and inspire the intellectually inquisitive mind. I’m almost finished reading House of Debt: How They (and You) Caused the Great Recession, and How We Can Prevent It from Happening Again by Atif Mian, Princeton and Amir Sufi, Chicago University. I had bought it even before Mark Carney recommended it; it was recommended to me soon after it was published last year. No doubt Corbyn knows why debt is harmful, why fueling the housing market with debt is dangerous and why it is ominous that household debt in the UK is high. But in order to clarify and stimulate the mind Mian and Sufi’s book is both an essential and timely read, also to argue against the received wisdom that banks are different from other companies and need to be saved – no, they don’t. The two economists have formulated what they call “the primary policy lesson of bank support: To prevent runs and preserve the payment system, there is absolutely no reason for the government to protect long-term creditors and shareholders of banks.” – So true (as Icelanders know). Alors, an essential read, also to gather sensible arguments in the debate on banks and banking, debt and the housing market, all topics that the new Labour leader needs to be as skillful in debating as he is cultivating his allotment. Tax and the revenue lost to society due to the anti-social mixture of aggressive tax planning, tax evasion and offshore havens are close to Corbyn’s heart. To my mind, the most illuminating writer on these matters right now is the French economist Gabriel Zucman, who studied with Thomas Piketty (they have written articles together) and who has recently (and sadly) left the London School of Economics for Berkeley. I read his little book on tax havens when it came out in French last year but now it has luckily been published in English, called The Hidden Wealth of Nations. 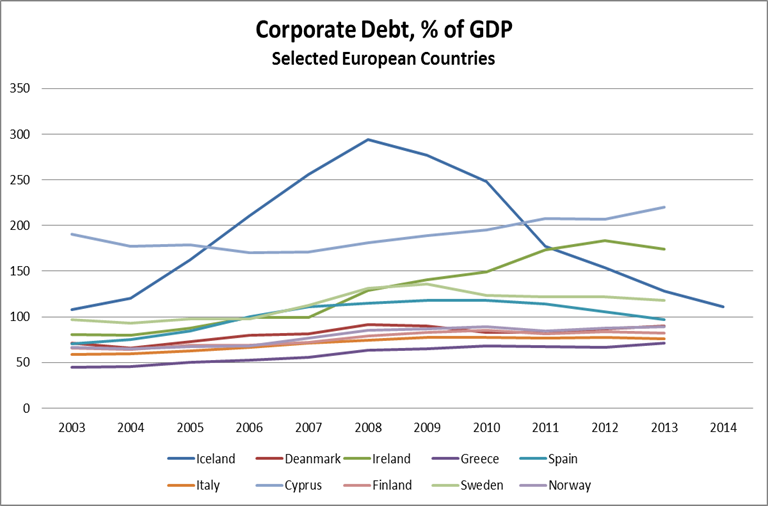 Much of the material is on-line and much of the reasoning is put forth in his 2013 article, The missing wealth of nations: are Europe and the U.S net debtors or net creditors? where Zucman i.a. points out “that around 8% of the global financial wealth of households is held in tax havens, three-quarters of which goes unrecorded.” – Yes, things to work on. These days, not only the lefties are preoccupied with inequality – not only is it socially harmful in terms of wasting and wasted human resources but it also hampers growth. An easy and insightful read, the harvested fruits of a lifetime of studying these issues, is gathered in The Haves and the Have-Nots: A Brief and Idiosyncratic History of Global Inequality, published in 2010. As an economist at the World Bank, the author Branko Milanovic (blogs here) worked on these issues long before they turned into a fashionable topic beyond the left margin of politics. And being an economist with a wealth of fabulous statistics at his finger tips he is both brilliant at choosing and presenting intriguing numbers, also with some striking graphs. The book that led me to reading Milanovic’ book was another very different but equally weighty book, also harvesting a life time of studying these issues. Angus Deaton’s The Great Escape: Health, Wealth and the Origin of Inequality, was published two years ago and I had the pleasure of listening to Deaton present his book in London last year. Deaton is a professor at Princeton and the inspiration for the book is partly his own family story of better lives in the generations spanning the 19th and into the 20th century. He investigates inequality not only from the perspective of wealth but also health. One point is that better health not only depends on money but good institutions. The great escape of the title is the escape from hunger and poverty, spanning centuries in historical overview. A riveting and optimistic read, though far from wishful thinking, i.a. on development. The clear conclusion is that concentrated wealth in the hands of few is now being used to buy influence on policy making for narrow special interests, not the general good of society. Again, Corbyn will not need to be exhorted in his doubts on privatisation but it is always good to gather insight and arguments for familiar causes, especially when you spend most of your waking hours arguing and reasoning for your points of view. I read The Commanding Heights by Daniel Yergin and Joseph Stanislaw when it came out in 1998. At the time its full title was The Commanding Heights: the Battle Between Government and the Marketplace that is Remaking the Modern World (the latter part was changed in a later edition to The Battle for the World Economy; I prefer the old one, more telling; here is a 3 parts documentary based on the book). Readers of Lenin will recognise where ,,commanding heights” stems from. At the time, I read it more or less in one go and have since given away several copies because I think that everyone remotely interested in politics should read it. Agree or not, it is essential to understand the driving forces behind privatisation especially for those who want to question them. I have for a long time meant to re-read it, would be interesting, considering events since the book was published. The book is often taken to have been one big bravo for globalisation and privatisation but that was not my impression at the time. After all, the authors strongly warn against special interests and stress the need for legitimacy. Apart from reading up topics that nourish his political thinking and reasoning the soul must not be forgotten. Here I suggest two books that tell stories of the have-nots in different parts of Europe in the 1930s, shaped by circumstances and ideas of that time. Independent People by the Icelandic Nobel price winner in 1955 Halldór Laxness was published in 1934. Inspired by Laxness’ infatuation with communism and socialism, it tells the story of Bjartur, a dirt-poor crofter who fights for living independent of others, without realising that his strife goes against his own interests. Carlo Levi’s novel, Christ stopped at Eboli, is the memoir of his political exile in a remote part of Southern Italy, Basilicata, in the years 1935-1936, not published until 1945. In Iceland, the cold harsh climate made for a difficult life but in Italy the heat and the barren earth was no less harsh. Written by brilliant and reflecting minds, both books are further demonstrations of the topic above: debt, private ownership and inequality. Icelandic authorities ignored warnings before October 2008 on the expanded banking system threatening financial stability but the shock of 90% of the financial system collapsing focused minds. Disciplined by an International Monetary Fund program, Iceland applied classic crisis measures such as write-down of debt and capital controls. But in times of shock economic measures are not enough: Special Prosecutor and a Special Investigative Committee helped to counteract widespread distrust. Perhaps most importantly, Iceland enjoys sound public institutions and entered the crisis with stellar public finances. Pure luck, i.e. low oil prices and a flow of spending-happy tourists, helped. Iceland is a small economy and all in all lessons for bigger countries may be limited except that even in a small economy recovery does not depend on a one-trick wonder. Concluding Statement, though pointing out there were however things to worry about: the banking system with its foreign operations looked ominous, having grown from one gross domestic product, GDP, in 2003 to ten fold the GDP by 2008. In early October 2008 the enviable medium-term prospect were clouded by an unenviable banking collapse. All through 2008, as thunderclouds gathered on the horizon, the Central Bank of Iceland, CBI, and the coalition government of social democrats led by the Independence party (conservative) staunchly and with arrogance ignored foreign advice and warnings. Yet, when finally forced to act on October 6 2008, Icelandic authorities did so sensibly by passing an Emergency Act (Act no. 125/2008; see here an overview of legislation related to the restructuring of the banks and here more broadly on economic measures). Iceland entered an IMF program in November 2008, aimed at restoring confidence and stabilising the economy, in addition to a loan of $2.1bn. In total, assistance from the IMF and several countries amounted to ca. $10bn, roughly the GDP of Iceland that year. In spite of mostly sensible measures political turmoil and demonstrations forced the “collapse government” from power: it was replaced on February 1 2009 by a left coalition of the Left Green party, led by the social democrats, which won the elections in spring that year. In spite of relentless criticism at the time, both governments progressed in dragging Iceland out of the banking mess. 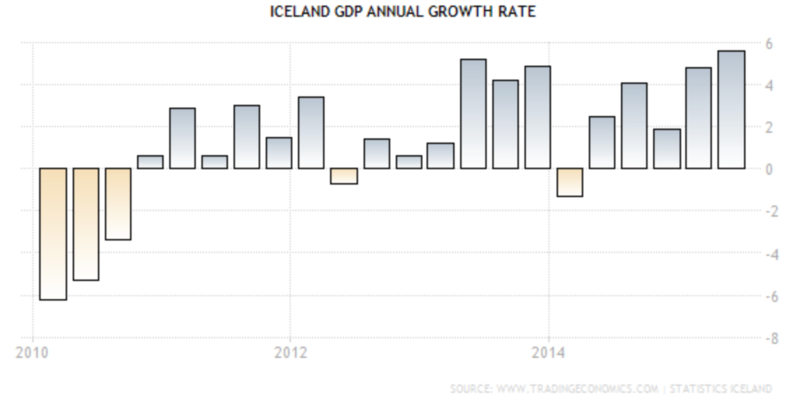 After the GDP contracted by 4% in the first three years the Icelandic economy was already back to growth summer 2011 and is now in its fifth year of economic growth. In 2015, Iceland became the first European country, hit by crisis in 2008-2010, to surpass its pre-crisis peak of economic output. Iceland is now doing well in economic terms and yet the soul is lagging behind. Trust in the established political parties has collapsed: instead, the Pirate party, which has never been in government, enjoys over 30% following in opinion polls. 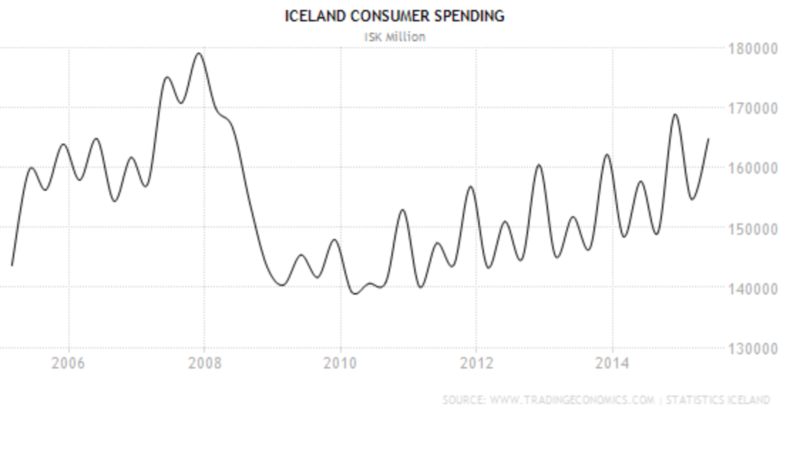 Compared to Ireland and Greece, Iceland’s recovery has been speedy, giving rise to questions as to why so quick and could this apparent Icelandic success story be applied elsewhere. Interestingly, much of the focus of that debate is very narrow and in reality not aimed at clarifying the Icelandic recovery but at proving or disproving aspects of austerity, the euro or both. Unfortunately, much of this debate is misleading because it is based on three persistent myths of the Icelandic recovery: that Iceland avoided austerity, did not save its banks and that the country defaulted. All three statements are wrong: Iceland has not avoided austerity, it did save some banks though not the three largest ones and did not default. Indeed, the high cost of the Icelandic collapse is often ignored, amounting to 20-25% of GDP. Yet, not as high as feared to begin with: the IMF estimated it could be as much as 40%. The net fiscal cost of supporting and restructuring the banks is, according to the IMF 19.2% of GDP. Costliest banking crisis since 1970; Luc Laeven and Fabián Valencia. As to lessons to avoid the kind of shock Iceland suffered nothing can be learnt without a thorough investigation as to what happened, which is why I believe the report, a lesson in itself, by the Special Investigative Commission, SIC, in 2010 was fundamental. Tackling eventual crime, as by setting up the Office of the Special Prosecutor, is important to restore trust. Recovering from a collapse of this magnitude is not only about economic measures and there certainly is no one-trick fix. On specific issues of the economy it is doubtful that Iceland, a micro economy, can be a lesson to other countries but in general, the lessons are simple: sound public finances and sound public institutions are always essential but especially so in times of crisis. The path of the Icelandic economy over the past fifty years has been a path up mountains and down deep valleys. Admittedly, the banking collapse was a major shock, entirely man-made in a country used to swings according to whims of fishing stocks, the last one being in the last years of the 1990s. What matters most in a crisis country? Cleary a myriad of things but in hindsight, if a country is heading for a major crisis make sure the public finances are in a sound state and public authorities and institutions staffed with competent people, working for the general good of society and not special interests – admittedly not a trivial thing. Since 1980 Icelandic sovereign debt to GDP was on average 48.67%, topped at almost 60% around the crisis in late 1990s and had been going down after that. Compare with Greece. Same with the public budget: there was a surplus of 5-6% in the years up to 2008, against an average of -1.15% of GDP from 1998 to 2014. With a shocking deficit of 13.5% in 2009 it has since steadily improved, pointing to a balanced budget this year and a tiny surplus forecasted for next year. 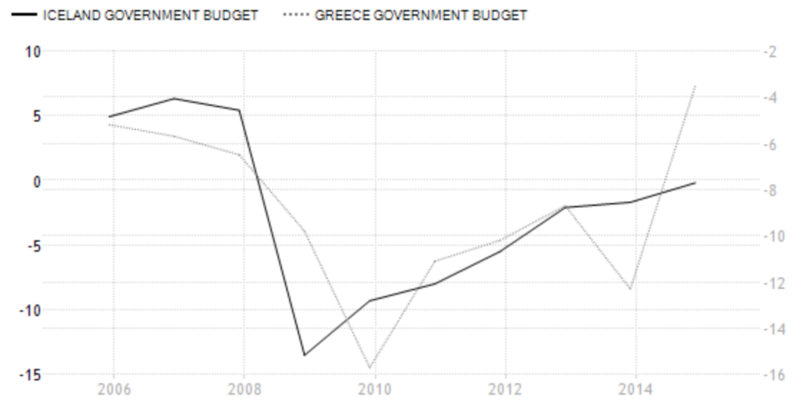 Again, compare with Greece. As to institutions, the CBI has been crucial in prodding the necessary recovery policies; much more so after change of board of governors in early 2009. Sound institutions and low corruption is the opposite of Greece, where national statistics were faulty for more than a decade (see my Elstat saga here). In early 2007, with sound state finances and fiscal strength the situation in Iceland seemed good. The banks felt invincible after narrowly surviving the mini crisis on 2006 following scrutiny from banks and rating agencies (the most famous paper at the time was by Danske Bank’s Lars Christensen). Icelanders were keen on convincing the world that everything was fine. The Icelandic Chamber of Commerce hired Frederic Mishkin, then professor at Columbia, and Icelandic economist Tryggvi Þór Herbertsson to write a report, Financial Stability in Iceland, published in May 2006. Although not oblivious to certain risks, such as a weak financial regulator, they were beating the drum for the soundness of the Icelandic economy. But like in fairy tales there was one major weakness in the economy: a banking system with assets, which by 2008 amounted to ten times the country’s GDP. Among economists it is common knowledge that rapidly growing financial sector leads to deterioration in lending. In Iceland, this was blissfully ignored (and in hindsight, not only in Iceland: Royal Bank of Scotland is an example). Instead, the banking system was perceived to be the glory of Icelandic policies in a country that had only ever known wealth from the sea. Finance was the new oceans in which to cast nets and there seemed to be plenty to catch. In early 2008 things had however taken a worrying turn: the value of the króna was declining rapidly, posing problems for highly indebted households – 15% of their loans were in foreign currency, i.a. practically all car loans. The country as a whole is dependent on imports and with prices going up, inflation rose, which hit borrowers; consumer-price indexed, CPI, loans (due to chronic inflation for decades) are the most common loans. Iceland had been flush with foreign currency, mainly from three sources: the Icelandic banks sought funding on international markets; they offered high interest rates accounts abroad – most of these funds came to Iceland or flowed through the banks there (often en route to Luxembourg) – and then there was a hefty carry trade as high interest rates in Iceland attracted short- and long-term investors. “How safe are your savings?” Channel 4 (very informative to watch) asked when its economic editor Faisal Islam visited Iceland in early March 2008. CBI governor Davíð Oddsson informed him the banks were sound and the state debtless. Helping the banks would not be “too much for the state to swallow (and here Oddsson hesitated) if it wanted to swallow it.” – Yet, timidly the UK Financial Services Authority, FSA, warned savers to pay attention not only to the interest rates but where the deposits were insured the point being that Landsbanki’s Icesave accounts, a UK branch of the Icelandic bank, were insured under the Icelandic insurance scheme. The 2010 SIC report recounts in detail how Icelandic authorities ignored or refused advise all through 2008, refused to admit the threat of a teetering banking system, blamed it all on hedge funds and soldiered on with no plan. Facing a collapsing banking system did focus the minds of politicians and key public servants who over the weekend of October 4 to 5 finally realised that the banks were beyond salvation. The Emergency Act, passed on October 6 2008 laid the foundation for splitting up the banks. Not into classic good and bad bank but into domestic and foreign operations, well adapted to alleviating the risk for Iceland due to the foreign operations of the over-extended banks. The three old banks – Kaupthing, Glitnir and Landsbanki – kept their old names as estates whereas the new banks eventually got new names, first with the adjective “Nýi,” “new,” later respectively called Arion bank, Íslandsbanki and Landsbankinn. Following the split, creditors of the three banks own 87% of Arion and 95% of Íslandsbanki, with the state owning the remaining share. Due to Icesave Landsbanki was a different case, where the state first owned 81.33%, now 97.9%. In dividing the estate of a bankrupt financial undertaking, claims for deposits, pursuant to the Act on on (sic) Deposit Guarantees and an Investor Compensation Scheme, shall have priority as provided for in Article 112, Paragraph 1 of the Act on Bankruptcy etc. By making deposits a priority claim in the collapsed banks interests of depositors were better secured than had been previously (and normally is elsewhere). When 90% of a financial system is swept away keeping payment systems functioning is a major challenge. As one participant in these operations later told me the systems were down for no more than ca. five or ten minutes during these fateful days. All main institutions, except of course the three banks, withstood the severe test of unprecedented turmoil, no mean feat. The coming months and years saw the continuation of these first crisis measures. It is frequently stated that Iceland, the sovereign, was bankrupted by the collapse or defaulted on its debt. 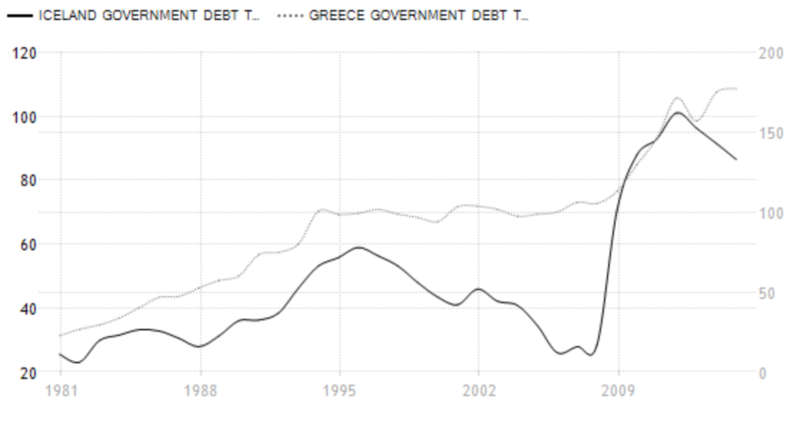 That is not correct though sovereign debt jumped from ca. 30% of GDP in 2008 until it peaked at 101% in 2012. That fateful first weekend of October 2008 it so happened that there were people from the IMF visiting Iceland and they followed the course of events. Already then seeking IMF assistance was discussed but strong political forces, mainly around CBI governor Davíð Oddsson, former prime minister and leader of the Independence party, were vehemently against. One of the more surreal events of these days was when governor Oddsson announced early morning on October 7 that Russia would lend Iceland €4bn, with maturity of three to four years, the terms 30 to 50 basis points over Libor. According to the CBI statement “Prime Minister Putin has confirmed this decision.” – It has never been clarified who offered the loan or if Oddsson had turned to the Russians but as the Cypriot and Greek government were to find out later this loan was never granted. If Oddsson had hoped that a Russian loan would help Iceland avoid an IMF program that wish did not come true. An alarming government deficit of 13.5% was now forecasted for 2009 with public debt projected to rise from 29% to 109% of GDP. “The intention is to reduce the structural primary deficit by 2–3 percent annually over the medium-term, with the aim of achieving a small structural primary surplus by 2011 and a structural primary surplus of 3½-4 percent of GDP by 2012.” – This was never going to be austerity-free. By November 20 2008 IMF funds had been secured, in total $2.1bn with $827m immediately available and the remaining sum paid in instalments of $155m, subject to reviews. The program was scheduled for two years and the loan would be repaid 2012 to 2015. Earlier in November Iceland had secured loans of $3bn from the other Nordic countries together with Russia and Poland (acknowledging the large Polish community in Iceland). Even the tiny Faroe Islands chipped in with $50m. In addition, governments in the UK, the Netherlands and Germany reimbursed depositors in Icelandic banks, in all ca. $5bn. Thus, Iceland got financial assistance of around $10bn, at the time equivalent of one GDP, to see it through the worst. In spite of a lingering suspicion against the IMF, both on the political left and right, there was never the defiance à la greque. Both the “collapse coalition” and then the left government swallowed the bitter pill of an IMF program and tried to make the best of it. Many officials have mentioned to me that the discipline of being in a program helped to prioritise and structure the necessary measures. Recently, an Icelandic civil servant who worked closely with the IMF staff, told me that this relationship had been beneficial on many levels, i.a. had the approach of the IMF staff to problem solving been an inspiration. Here was a country willing to learn. Part of the answer to why Iceland did so well is that the two governments more or less followed the course set out in he IMF program. This turned into a success saga for Iceland and the IMF. One major reason for success was Iceland’s ownership of the program: politicians and leading civil servants made great effort to reach the goals set in the program. – An aside to the IMF: if you want a successful program find a country like Iceland to carry it out. For those at work on crisis measures at the CBI and the various ministries there was little breathing space these autumn weeks in 2008. No sooner was the Emergency Act in place and the job of establishing the new banks over (in reality it took over a year to finalise) when a new challenge appeared: the rapidly increasing outflow of foreign funds threatened to sink the króna below sea level and empty the foreign currency reserves of the CBI. On November 28 the CBI announced that following the approval of the IMF, capital flows were now restricted but would be lifted “as soon as circumstances allow.” De facto, Iceland was now exempt from the principle of freedom of capital movement as this applies in the European Economic Area, EEA. The controls were on capital only, not on goods and services, affected businesses but not households. At the time they were set, the capital controls kept in place foreign-owned ISK650bn, or 44% of Icelandic GDP, mostly harvest from carry trades. Following auctions and other measures these funds had dwindled down to ISK291bn by the end of February 2015, just short of 15% of GDP. However, other funds have grown, i.e. foreign-owned ISK assets in the estates of the failed banks, now ca. ISK500bn or 25% of GDP. In addition, there is no doubt certain pressure from Icelandic entities, i.e. pension funds, to invest abroad. The Icelandic Pension Funds Association estimates the funds need to invest annually ISK10bn abroad. Greater financial and political stability in Iceland will help to ease the pressure. (Further to the numbers behind the capital controls and plan to ease them, see my blog here). With capital controls to alleviate pressure politicians in general have the tendency to postpone solving the problems kept at bay by the controls; this has also been the case in Iceland. The left government made various changes to the Foreign Exchange Act but in the end lacked the political stamina to take the first steps towards lifting them. With up-coming elections in spring 2013 it was clear by late 2012 that the government did not have the mandate to embark on such a politically sensitive plan so close to elections. In spring 2015, after much toing and froing, the coalition of Independence party led by the Progressive party presented a plan to lift the controls. The most drastic steps will be taken this winter, first to bind what remains from the carry trades and second to deal with the estates, where ca. 80% of their foreign-owned ISK assets will be paid as a “stability contribution” to the state. (I have written extensively on the capital controls, see here). The IMF estimates it might take up to eight years to fully lift the controls. It is notoriously difficult to measure the effects of capital controls. It is however a well-known fact that with time capital controls have a detrimental effect on the economy, as the CBI has incessantly pointed out in its Financial Stability reports. “… as capital controls restricted investment opportunity abroad, both foreign and local holders of offshore króna found it profitable to invest in government bonds, which facilitated the financing of budget deficit and helped avoid a sovereign financing crisis.” – Considering the direct influence of inflation, due to CPI-indexation of household debt, the benefits also count for households. Again, measuring is difficult but the stability brought by the controls seems to have helped though the plan to lift them came none too soon. Some economists claim the controls were unnecessary and have only done harm. None of their arguments convince me. Icelandic households have for decades happily lived beyond their means, i.e. 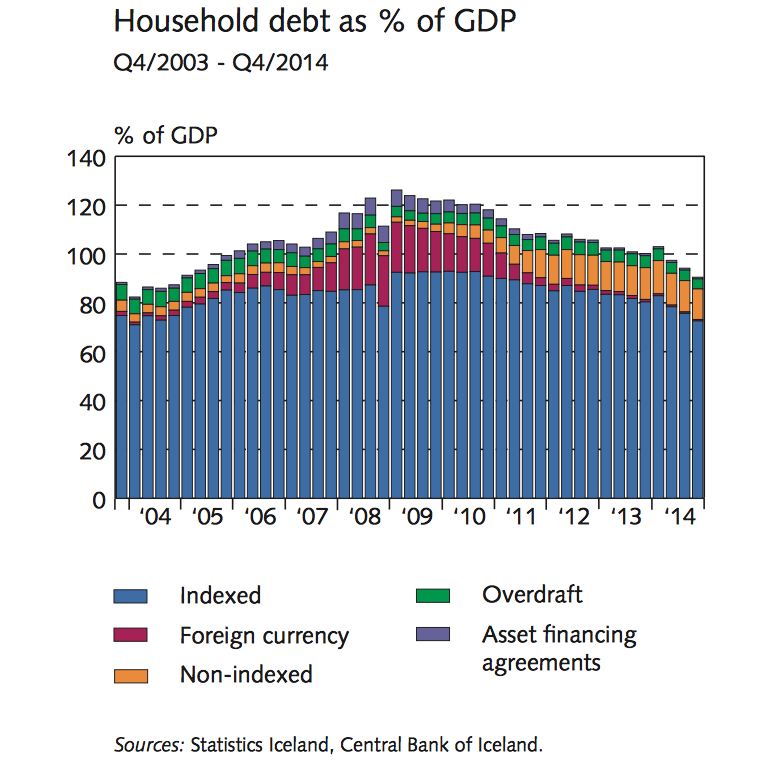 household debt has been high in Iceland. The debt peaked in 2009 but has been going down rapidly since then. Already in early 2008, the króna started to depreciate versus other currencies. From October 2007 to October 2008 the changes were dramatic: €1 stood at ISK85 at the beginning of this period but at ISK150 in the end; by October 2009 the €1 stood at ISK185. Even before the collapse it was clear that households would be badly hit in various ways by the depreciating króna, i.a. due to the CPI-indexation of loans as mentioned above. In addition, banks loaded with foreign currency from the carry trades had for some years been offering foreign currency loans, in reality loans indexed against foreign currencies. With the króna diving instalments shot up for those borrowing in foreign currency; as pointed out earlier, 15% of household debt was in foreign currency. The left government’s main stated mission was to shield poorer households and defend the welfare system during unavoidable times of austerity following the collapse. In addition, there was also the point that in a contracting economy private spending needed to be strengthened. The first measure aimed directly at households was in November 2008 when the government announced that people could use private pension funds to pay down debt. Soon after the banking collapse borrowers with loans in foreign currency turned to the courts to test the validity of these loans. As the courts supported their claims the government stepped in to push the banks to recalculate these loans. In total, at the end of January 2012 write-downs for households amounted to ISK202bn. For non-financial companies the write-downs totalled ISK1108bn by the end of 2011 (based on numbers from Icelandic Financial Services Association). 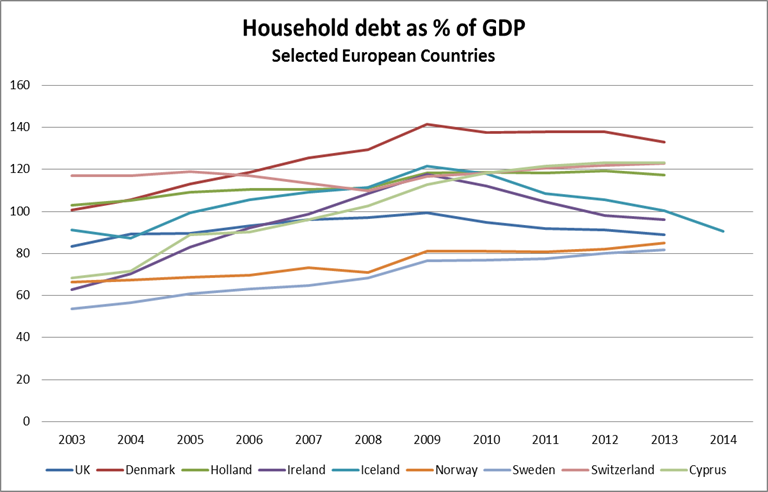 In general, Icelandic households have been deleveraging rapidly since the crisis. Governments in other crisis countries have been reluctant to burden banks with the cost of write-downs and non-performing loans. In Iceland, there was a much greater political willingness to orchestrate write-downs. The fact that foreign creditors owned two of the three banks may also have made it less painful to Icelandic politicians to subject the banks to the unavoidable losses stemming from these measures. In 2010 the Icelandic Bankruptcy Act was changed. Most importantly, the time of bankruptcy was shortened to two years. The period to take legal action was shortened to six months. There are exemptions from this in case of big companies and bankruptcy procedures for financial companies are different. However, the changes profited individuals and small companies. In crisis countries such as Greece, Ireland and Spain bankruptcy laws has been a big hurdle in restructuring household finances, only belatedly attended to. It was indicative of the political climate in Iceland that when the minister of finance, trade and economy Steingrímur Sigfússon, leader of the Left Green party, announced in summer 2011 that the economy was now growing again his tone was that of an undertaker. After all, the growth was “only” forecasted to be around 2%, much less than what Iceland had enjoyed earlier. Yet, this was a growth figure most of his European colleagues would have shouted from the rooftops. Abroad, Sigfússon was applauded for turning the economy around but he enjoyed no such appreciation in Iceland. As inequality diminished during the first years of the crisis the government could to a certain degree have claimed success (see on austerity below). However, the left government did poorly in managing expectations. Torn by infighting, its political opponents, both in opposition and within the coalition parties never tired of emphasising that no measures were ever enough. That was also the popular mood. The króna: help or hindrance? Much of what has been written on the Icelandic recovery has understandably been focused on the króna – if beneficial and/or essential to the recovery or curse – often linked to arguments for or against the EU and the euro. Those who believe in the benefits of own independent currency often claim that Iceland did devalue, as if that had been part of a premeditated strategy. That however was not the case: the króna has been kept floating, depreciating sharply when funds flowed out in 2008. The capital controls slammed the break on, stabilising and slowly strengthening the króna. Lately, with foreign currency inflows, i.a. from tourism, the króna has further appreciated but not as much as the inflows might indicate: the CBI buys up foreign currency, both to bolster its reserve and to hinder too strong a króna. Thus, it is appropriate to say that the króna float is steered but devaluation, as a practiced in Iceland earlier (up to the 1990s) and elsewhere, has not been a proper crisis tool. Had Iceland joined the EU in 1995 together with Finland and Sweden, would it have taken up the euro like Finland or stayed outside as Sweden did? There is no answer to this question but had Iceland been in the euro capital controls would have been unnecessary (my take on Icelandic v Greek controls, see here). Would the euro group and the European Central Bank, ECB, have forced Iceland, as Ireland, to save its banks if Iceland had been in the euro zone? Again, another question impossible to answer. After all, tiny Cyprus did a bail-in (see my Cyprus saga here). On average, fisheries have contributed around 10% to the Icelandic GDP, 11% in 2013 and the industry provided 15-20% of jobs. Fish is a limited resource with many restrictions, meaning that no matter markets or currency fishing more is not an option. Tourism has now surpassed the fishing industry as a share of GDP. Again, depreciating króna could in theory help here but Iceland is not catering to cheap mass tourism but to a more exclusive kind of tourism where price matters less. Attracting over a million tourists a year is a big chunk for a population of 330.000 but my hunch is that the value of the króna only has a marginal effect, much like on the fishing industry: the country’s capacity to receive tourists is limited. Currency is a barometer of financial soundness. One of the problems with the króna is simply the underlying economy and the soundness of the governments’ economic policies or lack of it, at any given time. Sound policies have often been lacking in Iceland, the soundness normally not lasting but swinging. Older Icelanders remember full well when the interests of the fishing industry in reality steered the króna, much like the soya bean industry in Argentina. The króna is no better or worse than the underlying fundamentals of the economy. In addition, in an interconnected world, the ability of a government to steer its currency is greatly limited, interestingly even for a major currency like the British pound. What counts for a micro economy like Iceland is not necessarily applicable for a reserve currency. Needless to say, the króna did of course have an effect on how Iceland fared after the collapse but judging exactly what that effect has been is not easy and much of what has been written is plainly wrong. (I have earlier written about the right to be wrong about Iceland; more recent example here). In addition, much of what has been written on Iceland and the króna is part of polemics on the EU and the euro and does little to throw light on what happened in Iceland. 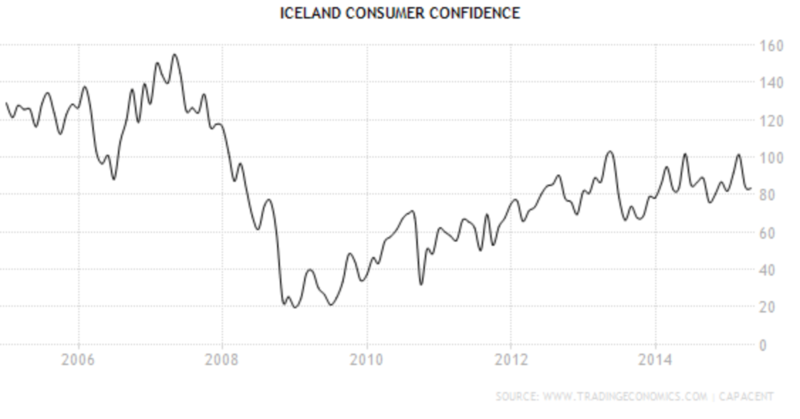 Iceland: no bailouts, no austerity? There have been two remarkably persisting stories told about the Icelandic crisis: 1) it didn’t save its banks and consequently no funds were used on the banks 2) Iceland did not undergo any austerity. – Both these stories are only myths, which have figured widely in the international debate on austerity-or-not, i.a. by Paul Krugman (see also the above examples on the right to be wrong about Iceland) who has widely touted the Icelandic success as an example to follow. Others, like Tyler Cowen, have been more sceptical. True, Iceland did not save its three largest banks. Not for lack of trying though but simply because that task was too gigantic: the CBI could not possibly be the lender of last resort for a banking system ten times the GDP, spread over many countries. When Glitnir, the first bank to admit it had run out of funds, turned to the CBI for help on September 29 2008, the CBI offered to take over 75% of the bank and refinance it. It only took a few days to prove that this was an insane plan. The CBI lent €500m to Kaupthing on the day the Alþingi passed the Emergency Act, October 6 2008, half of which was later lost due to inappropriate collaterals. This loan is the only major unexplained collapse story. The left government later tried to save two smaller banks – a futile exercise, which only caused losses to the state – and did save some building societies. The worrying aspect of these endeavours was the lack of clear policy; it smacked of political manoeuvring and clientilismo and only added to the high cost of the collapse, in international context. As to austerity, every Icelander has stories to tell about various spending cuts following the shock in October 2008. Public institutions cut salaries by 15-20%, there were cuts in spending on health and education. (Further on cuts see IMF overview 2012). With the left government focused on the poorer households it wowed to defend benefit spending and interest rebates on mortgages. These contributions are means-tested at a relatively low income-level but helped no doubt fending off widening inequality. Indeed, the Gini coefficients have been falling in Iceland, from 43 in 2007 to 24 in 2012, then against EU average of 30.5. (See here for an overview of the social aspects of the collapse from October 2011, by Stefán Ólafsson). In addition, it is however worth observing that although inequality in general has not increased, there are indications that inter-generational inequality has increased, as pointed out in the CBI Financial Stability Report nr. 1, 2015: at end of 2013 real estate accounted for 82% of total assets for the 30 to 40 years age group, compared to 65% among the 65 to 70 years old. The younger ones, being more indebted than the older ones are much more vulnerable to external shocks, such as changes in property prices and interest rates. Renters and low-income families with children, again more likely to be young than older people, are still vulnerable groups. 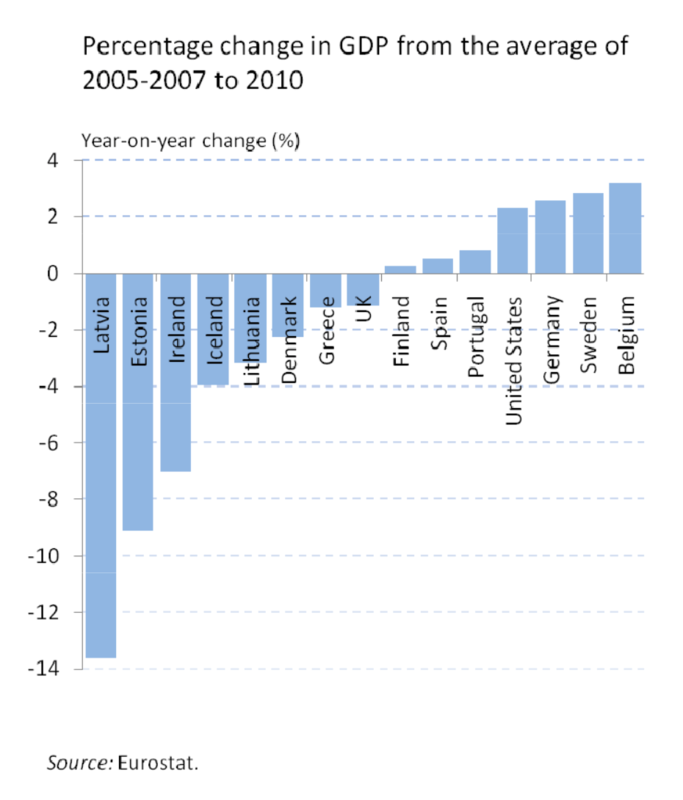 In the years following the crisis the unemployment jumped from 2.4% in 2008 to peak of 7.6% in 2011, now at 4.4%. Even 7.6% is an enviable number in European perspective – the EU-28 unemployment was 9.5% in July 2015 and 10.9.% for the euro zone – but alarming for Iceland that has enjoyed more or less full employment and high labour market participation. Many Icelanders felt pushed to seek work abroad, mostly in Norway, either only one spouse or the whole family. Poles, who had sought work in Iceland, moved back home. Both these trends helped mitigate cost of unemployment benefits. Austerity was not the only crisis tool in Iceland but the country did not escape it. And as elsewhere, some have lamented that the crisis was not used better to implement structural changes, i.a. to increase competition. Iceland is entirely dependent on oil for transport and the fishing fleet is a large consumer of oil. Iceland is also dependent on imports, much of which reflect the price of oil, as does the cost of transport to and from the country. It is pure luck that oil prices have been low the years following the collapse, manna from heaven for Iceland. The increase in tourism has been crucial after the crisis. Tourism certainly is a blessing but the jobs created are notoriously low-paying jobs. As anyone who has travelled around in Iceland can attest to, much of these jobs are filled not by Icelanders but by foreigners. Until 2008, mackerel had never been caught in any substantial amount in Icelandic fishing waters: the catch was 4.200 ton in 2006, 152.000 ton in 2012. Iceland risked a new fishing war by unilaterally setting its mackerel quota. Fishing stocks are notoriously difficult to predict and the fact that the mackerel migrated north during these difficult years certainly was a stroke of luck. As Icelanders caught their breath after the events around October 6 2008 the country was rife with speculations as to what had indeed happened and who was to blame. There were those who blamed it all squarely on foreigners, especially the British. 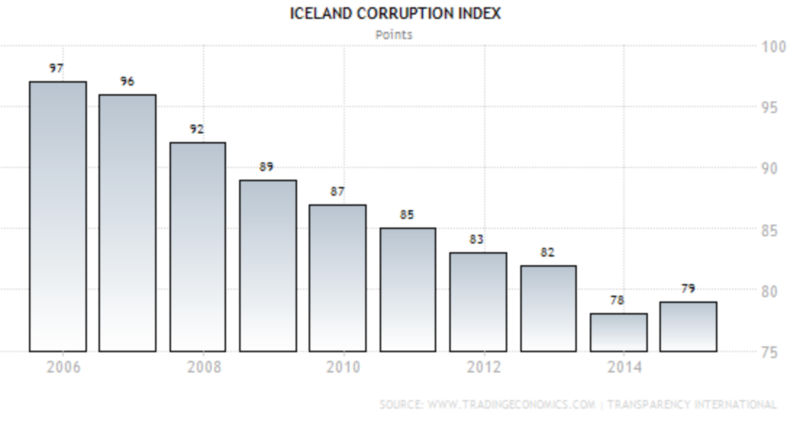 But the collapse also changed the perception of Icelanders of corruption and this perception has lingered in spite of action taken against individuals. This seems to be changing, yet slowly. When Vilhjálmur Bjarnason, then lecturer at the University of Iceland, now MP for the Independence party, said following the collape that around thirty men (yes, all males) had caused the collapse, many nodded. Everyone roughly knew who they were: senior bankers, the main shareholders of the banks and the largest holding companies, all prominent during the boom years until the bitter end in October 2008. Many of these thirty have now been charged, some are already in prison and other fighting their case in courtrooms. Alþingi responded swiftly to these speculations, by passing two Acts in December: setting up an Office of a Special Prosecutor, OSP and a Special Investigative Committee, SIC to clarify the collapse of the financial sector. These two Acts proved important steps for clearing the air and setting the records straight. After a bumpy start – no one applied for the position of a Special Prosecutor – Ólafur Hauksson a sheriff from Reykjavík’s neighbouring town Akranes was appointed in January 2009. Out of 147 cases in the process of being investigated at the beginning of 2015, 43 are related to the collapse (the OSP now deals with all serious cases of financial fraud). The Supreme Court has ruled in seven cases related to the collapse and sentenced in all but one case; Kaupthing’s second largest shareholder and three of the bank’s senior managers are now in prison after a ruling in the so-called al Thani case. – Gallup Iceland regularly measures trust in institutions. Since the OSP was included, in 2010, it has regularly come out on top as the institution enjoying the highest trust. As to the SIC its report, published on 12 April 2010, counts a 2600 page print version, which sold out the day it was published, with additional material online; an exemplary work in its thoroughness and clarity. The trio who oversaw the work – its chairman then Supreme Court judge Páll Hreinsson (now judge at the EFTA Court), Alþingi’s Ombudsman Tryggvi Gunnarsson and Sigríður Benediktsdóttir then lecturer in economics at Yale (now head of Financial Stability at the CBI) – presented a convincing saga: politicians had not understood the implication of the fast growing banking sector and its expansion abroad, regulators were too weak and incompetent, the CBI not alert enough and the banks egged on by over-ambitious managers and large shareholders who in some cases committed criminality. How have these two undertakings – the OSP and the SIC – contributed to the Icelandic recovery? I fully accept that the effect, as I interpret it, is subjective but as said earlier: recovery after such a major shock is not only about direct economic measures. Setting up the OSP has strengthened the sense that the law is blind to position and circumstances; no alleged crime is too complicated to investigate, be it a bank-robbery with a crowbar or excel documents from within a bank. The OSP calmed the minds of a nation highly suspicious of bankers, banks and their owners. The benefit of the SIC report is i.a. that neither politicians nor special interests can hi-jack the collapse saga and shape it according to their interests. The report most importantly eradicated the myth that foreigners were only to blame – that Iceland had been under siege or attack from abroad – but squarely placed the reasons for the collapse inside the country. The SIC had a wide access to documents, also from the banks. The report lists loans to the largest shareholders and other major borrowers. This clarified who and how these people profited from the banks, listed companies they owned together with thousands of Icelandic shareholders. The SIC’s thorough and well-documented saga may have focused the political energy on sensible action rather than wasting it on the blame game. Interestingly, this effect is no less relevant as time goes by. To my mind, the atmosphere both in Ireland and Greece, two countries with no documented overview of what happened and why, testifies to this. In addition, the report diligently focuses on specific lessons to be learnt by the various institutions affected. Time will show how well the lessons were learnt but at least heads of some of these institutions took the time and effort, with their staff, to study the outcome. A country rife with distrust and suspicion is not a good place to be and not a good place for business. Both these undertakings cleared the air in Iceland – immensely important for a recovery after such a shock, which though in its essence an economic shock is in reality a profound social shock as well. I mentioned sound institutions above. Their effect is not easily measureable but certainly well functioning key institutions such as ministries, National Statistics and the CBI have all been important for the recovery. (i) strong ownership of the program … (ii) the social impact can be eased in the face of fiscal consolidation following a severe crisis by cutting expenditures without compromising welfare benefits, while introducing a more progressive tax system and improving efficiency; (iii) bank restructuring approach allowing creditors to take upside gains but also bear part of the initial costs helped limit the absorption of private sector losses by public sector; and (iv) after all other policy options are exhausted, capital controls could be used on a temporary basis in crisis cases such as Iceland, where capital controls have helped prevent disorderly deleveraging and stabilize the economy. The above understandably refers to the economic recovery but recovering from a shock like the Icelandic one – or as in Ireland, Greece and Cyprus – is not only about finding the best economic measures, though obviously important. It is also about understanding and coming to terms with what happened. As mentioned above, I firmly believe that apart from classic measures regarding insolvent banks and debt, both sovereign and private, the need to clarify what happened, as was done by the SIC and to investigate alleged criminality, as done by the OSP, is of crucial importance – something that Ireland (with a late and rambling parliamentary investigation), Greece, Cyprus and Spain could ponder on. All of this in addition to sound institutions and sound public finances before a crisis. In the olden days it was said that by traveling as fast as one did in a horse-drawn carriage the soul, unable to travel as fast, lagged behind (and became prone to melancholia). Same with a nation’s mood following an economic depression: the soul lags behind. After growth returns and employment increases it takes time until the national mood moves into the good times shown by statistics. Iceland is a case in point. Although the country returned to growth, with falling unemployment, in 2011 the debate was much focused on various measures to ease the pain of households and nothing seemed ever enough. With plan in place to lift capital controls, the last obvious sign of the 2008 collapse will be out of the way. Implementation will take some years; a steady and secure execution this coming winter will hopefully lift spirits in the business community. Living intimately with forces of nature, volcanoes and migrating fish stocks, and now tourists, as fickle as the fish in the ocean, Icelanders have a certain sangue-froid in times of uncertainty. Actions by the three governments since the collapse have at times been rambling but on the whole they have sustained recovery. A sign of the lagging soul is that growth has not brought back trust in politics. Politicians score low: the most popular party now enjoying ca. 35% in opinion polls, almost seven years after the collapse and four years since turning to growth, is the Pirate party, which has never been in government. However, the worrying aspect is that in addition to fisheries partly based on cheap foreign labour the new big sector, tourism, is the same. Notoriously low productivity – a chronic Icelandic ill – will not be improved by low-paid foreign labour. Well-educated and skilled Icelanders are moving abroad whereas foreigners moving to the country have fewer skills. Worryingly, there is little political focus on this. Iceland does not have time to rest on its recovery laurels. Moving out of the shadow of the crisis the country is now faced with the old but familiar problems of navigating a tiny economy in the rough Atlantic Ocean. After barely making it on to the ballot paper, Jeremy Corbyn beats even Tony Blair’s 1994 record and gathers 59.5% support for leadership. Anti-establishment parties have been sprouting in Europe but the fairly unique aspect of Corbyn’s success is his rise within an old and established party. Much is made of his (self-proclaimed) socialism. Yet, it is more likely that Corbyn gathered support not because he is a socialist but in spite of being one. Getting elected as a leader was the easy bit; leading will be the truly tricky part unless Corbyn proves to be a political virtuoso – and the European left will be watching. Given the earlier success of Tony Blair and another charismatic politician Bill Clinton it became received wisdom that no political career could possibly be successful without their kind of flashy charisma. Also here, Corbyn disproves so far the accepted wisdom: he is serious at rallies and often grumpy in the media but what he says fits him like his beard. Compared to recent political stars in Europe Corbyn is the only outsider in an old party to challenge the party elite and be voted as a leader. The last outsider achieving was Margret Thatcher elected as Tory leader in 1975. As Corbyn, she was not expected to last long. Famously, Thatcher and later Blair proved themselves to be eminent at capturing the nation’s mood. Briefly, Corbyn has done the same but a lasting success will only arise if he can use his popularity to create a Labour power base. The European left will be watching. In times of slow growth and contraction, there has been no lack of new European parties of discontent and anger. The Italian Movimento Cinque Stelle, M5S rose on the fame of its leader Beppe Grillo, accountant and comedian, a year older than Corbyn. M5S has more or less imploded: Grillo was good at being angry in public but useless at organising a party machine. The Greek Syriza, born on the old-style Greek left, shot to fame with its energetic leader Alexis Tsipras. Unable to fulfil his promises, he now fights an election and might be losing the surge that brought him to power in February. New political movements in Spain – the left Podemos, the activist “idignados” and Ciudadanos on the right – will no doubt influence the coming elections there. Again, unclear if these parties can turn popularity into power. In the stable North long-simmering far-right anti-establishment sentiments have grown stronger in Finland, Sweden and Denmark. In Iceland, the Pirate party got 5% in the election in spring 2013, just enough to get into Parliament but has been scoring over 30% in polls since early this year. Compared to once upon a time voters are now not only less wedded to one party but also travel back and forth between left and right. Considering the volatility of voters it seems to make more sense to see these new-comers as an expression of discontent with old parties rather than necessarily as a sign of swing to the left or right in the respective countries. It is more a question of who appeals strongest to the party-unfaithfuls and disillusioned at any given time. This also seems to be the context for Corbyn – there is no indication that British voters are swinging to the left. After all, Ukip did well in last elections. Given the chance, voters turn against the political establishment and embrace something new. The irony is that the new is now a 66 years old leftie backbencher, in Parliament since 1983, echoing the socialism of his youth, generally unknown to others than his Islington voters, whom he has served by mostly being in opposition to the Labour party leadership at any given time. The singular aspect of the Western crisis that surfaced in 2007 was the fact that it was created by banks and their, for the society at large, unhealthy and anti-social activities in the years up to 2007. Strangely enough, Labour let itself be ensnared by the opposition’s narrative during the 2015 spring elections that it had mismanaged the economy during its years in power, 1997 to 2010. Fettered by this narrative Labour kept quiet about the fact that Labour and the Tories, united in its admiration for an apparently booming finance industry, shared the laissez-faire view of scaled-back regulation. During the boom, neither party worried about weak regulators and underfunded and little-loved Serious Fraud Office and Inland Revenue. The underlying public anger surfaced in the Occupy movements and grass-root activities, largely ignored by the old and established parties both in Britain and elsewhere. In the 2010 elections Liberal democrats rose on the 2008 anger but were unable to turn that surge of popularity into lasting power. Yet, political elites might well have found a convincing response to 2008. Politicians on the right could argue for the capitalism of creation. It is not necessarily in the capitalistic spirit to let a sector, that in theory should be serving and nurturing the economy, tie up so much capital in its own money spinning activities that went so disastrously wrong, causing calamity for the rest of society. More surprisingly, European established left parties have mostly not responded to the crisis in any meaningful way and Labour is one of them. No leading Labour politicians seems i.a. interested in a coherent investigation of the UK banks’ activities before and after 2007. One reason why I notice the underlying anger it that hardly a week goes by without hearing someone mention the Icelandic example of investigating financial fraud related to the 2008 collapse. This silent space has been Corbyn’s to occupy, rhetorically asking if teachers, nurses etc. caused the financial crisis and weaving into it his anti-austerity stance. Quite remarkably, seven years on from 2008 and with the economy growing again, this old anger and frustration is still a fertile ground as Corbyn has now discovered and demonstrated. According to Corbyn, he had an army of sixteen thousand volunteers working for him. Quite something in an era of shrinking membership in established political parties. It is difficult to believe that this machine was put together in only three months – more likely, supportive trade unions provided him with all it took to build a smooth-running operation. If Corbyn the Labour leader translates his success into convincing policies backed by the Labour party he and his party will unavoidably become a leading light on the European left as New Labour once was. However, his challenges are formidable. He must i.a. enthuse the Labour party machine as he did with his own private election machine. Corbyn must also grapple with anchoring his messages into policies that gather support within in the party. A received wisdom in politics is that no one goes anywhere without a supportive media. Given that Corbyn uses every opportunity to kick the media, possibly perceiving it as part of the establishment and to strengthen his outsider-image, it will be interesting to see how he fares versus the media: if he will change course and court it or if he continues his adversarial angry attitude. When new Labour rose to power in 1997 they did not only lead Britain but set the tone for the whole of the European left. New Labour is no longer new but old and stale and the top-trend post has been empty for a while. The most recent contender was Syriza. With popularity and power Tsipris shot to fame among the European left who flocked to Greece to meet Syriza’s leading lights. I.a. Italian prime minister Matteo Renzi avidly courted Tsipras but, as others, quickly seemed to realise there was little to fetch. The European left, lately poor of success stories, will be following Corbyn closely though his anti-EU stance will make some Europeans wary. As seen in many European countries over the last few years, anger and frustration may gather popularity; but unless sustained by action and comprehensive policies it has little staying power and wanders on to the next eye-catching political promise-bidder. *See my earlier blog on Corbyn and patch-work politicians. This blog is cross-posted with uti.is. Once approved, the full re-engagement of the IMF is expected to reduce subsequently the ESM financing envelope accordingly. Is the Eurozone generally so transparent that the reason to have the IMF on board is to lesson the amount that a group of the world’s richest countries have to put on the table to sustain one of their own? Growth is a driver of migration. Get used to it. A seriously important blog post. Migration is a problem of success, not failure. As sub-Saharan Africa increasingly rises out of deep poverty, more people can afford to emigrate and are aware that life might be better somewhere else. The propensity to migrate is positively correlated with real per-capita GDP. In Latin America, however, the correlation is negative. Potential migrants are likely to be better off at home, except the poorest of the poor. The conclusions we can draw from this are salutary. First of all, they’re not going away. The development train has left the station, and one of its effects is that migration has become an option. Perhaps the pressure will reduce as more countries reach the middle-income level, but it’s not as if there aren’t plenty of migrants from Latin America to the US. Second, neither calling for more development aid (that you have no intention of delivering) or giving lectures on corruption and good governance will help at all, because migrants, as opposed to refugees, are not motivated by desperation but rather by hope. Nor will yelling about “benefits”, because they’re not beggars but economic migrants in the truest sense of the word. It’s also worth pointing out that the distinction between a refugee and a migrant is a spectrum rather than a bright line – if you can’t think of a way to persecute people by economic means you’re not trying, and as Rick points out above, development encourages movement for refugees, too. Third, very visibly, they are following the same routes trade follows, carrying their smartphones and wearing their FC Barca shirts. You can’t have 44-tonne trucks driving in two or three days from Dover to eastern Turkey and not have people moving along the same roads. The overwhelming conclusion is that we’ll just have to live with them. Punkt, ende. However I expect a lot of squirming on the hook before this sinks in. Like the War on Drugs or the rules of the eurozone, immigration is one of those issues where nobody believes in the system, nobody would design anything like it again, but it stumbles forward by the sheer inertia of incumbency.